He walked quietly between his two friends as he entered the conference hall in one of the best hotels in an exclusive enclave of Islamabad, the capital of Pakistan. The carpeted room filled with chairs draped in white as if for a wedding, usually hosted business conferences. But this event was different. The smart suited-business men and laptops had been usurped by rough-hewn boys and traditionally-dressed older men from the tribal mountains a few arduous hours from the capital. A row of elders greeted the attendees, lightly shaking hands as they gently touched their own chests in a traditional gesture. Deep-cut lines in their sun-hardened skin marked their years, full beards and elaborate head gear denoted their social standing. There was little chat as the three teenage boys filed to their seats. The men gathered had come to discuss death and destruction – the destruction of their homes and villages, the deaths of their children and friends. Like many in the room, Tariq Aziz had travelled for eight hours by public bus to join the group. Despite his black kameez, flat-topped cap and the start of a neat beard, Aziz was clearly much younger than many of the other men gathered. Seated just two rows directly in front was Jemima Khan, the British heiress, also dressed in a black traditional outfit edged with antique red and yellow embroidery, her thick, flowing hair left uncovered while in the hall. She tried hard not to attract attention, but her presence was so much at odds with those around her that it was difficult not to watch her reactions, not least because her former husband and now politician Imran Khan was also at the meeting. Events a few hundred miles away, in the mountains of the north had brought this odd group together. Waziristan is an inaccessible, remote region on the border of Afghanistan. Few people other than the locals ever travel into the rugged interior. Frequent checkpoints keep journalists and foreigners out. The ubiquitous mobile phones have stopped working since the mobile network was switched off. There is no major industry and little farm-land. Most supplies are driven in by colourfully painted Bedford or Hino trucks, one of the few jobs available. People live as they have for centuries, following old traditions and tribal codes. More than fifteen years ago, in 1996, Jemima Khan had travelled to the area, with her then husband Imran, and her father, Sir James Goldsmith, the billionaire financier. The tribesmen had regaled the visitors with stories of their fierceness. ‘One of the tribal elders came up to my father and said welcome to Waziristan. I just want to let you know that the last Englishman that came to these parts was 100 years ago, and our great grandfathers shot him,’ she recalled with a laugh. The men were warriors, violence was common, and Kalashnikov rifles carried openly, as they still are today. But it was not the tribal fighting that concerned the men who had gathered in the Islamabad hotel. Life in Waziristan was being threatened by a far more fiercesome weapon than the automatic rifle. Unmanned planes, remotely-controlled from the Nevada desert thousands of miles away, have become an almost everyday sight in the skies above the arid lands of the north. It was the frequent attacks by these planes, or drones, operated by America, supposedly an ally, that were the focus of the gathering. The drones had started flying, infrequently at first, over the northern mountains almost eight years ago. Initially they had hovered in the skies streaming video back to the operators – agents working for the US Central Intelligence Agency. They were gathering information about al Qaeda members allegedly hiding in the cut-off lands. But now these unmanned planes have become an almost constant, and deadly presence. Their deep, low dirge a terrifying symphony accompanying the villagers’ daily lives. They fly in packs, sometimes as many as a half dozen, circling the villages for hours, hovering over roads, before firing Hellfire missiles. As many as 3,000 people have been killed, though little more than a few lines ever gets reported in the Western press. This is a war fought largely out of sight of the global media, away from the connected world. They’re not just killing men, they are killing the women and children. When we hear the official statements from the US government that no civilians have been killed, how do you explain the dead children’s bodies? The “Jirga” – a traditional tribal meeting – last October was an attempt to raise attention to the events in this distant land. The villagers brought their evidence. They held up mangled lumps of metal – the remains of Hellfire missiles collected from roadsides and destroyed buildings. Photographs of orphaned children, bodies torn apart, vast craters left in the ground, destroyed buildings, burnt out cars were flashed up and pointed to by the men demanding that somebody be held to account. One young teenager told how he had lost an eye and both legs, an older man his eye too, in injuries they claimed were caused by shrapnel from one of the many blasts. And Tariq Aziz told how a cousin had been killed in early 2010 by a Hellfire missile fired at him when he was on his motorcycle near his home. He showed an ID card and talked of his cousin’s innocence. Jemima had joined the gathering to hear the stories, but also to offer help. She had spent nine years in Pakistan, married to Imran Khan and still feels very connected to the country, not least because her two sons are half Pakistani and visit the country several times a year. She had been contacted by Clive Stafford Smith, a British-American lawyer, who cut his teeth representing death row inmates in Louisiana and Mississippi in the 1990s, but gained a global reputation after he took on the Bush administration by representing dozens of young men imprisoned in Guantanamo Bay. The drone war in Waziristan is, for Stafford Smith, the next American injustice that needs taking on. And so these two very different lives had been brought together. After Islamabad, Jemima headed to Oman, to work on a project for Vanity Fair. In the serenely beautiful surroundings of the Omani desert she picked up an email. It had been sent by a contact in Pakistan – a lawyer working closely with families of drone victims. The subject line read simply: ‘Recent victim of drones folly’. Tariq Aziz – the young man who had been sitting just five feet away from her just a few days earlier, the teenager who had been so eager to help with the camera project, was dead. He was just 16. Another casualty of the US drones. Like so many teenagers in remote parts of the globe, Tariq though not legally old enough to drive, nonetheless had often taken out the family car. Around noon on October 31 he had been driving to pick up an aunt after her wedding. A slightly younger cousin, Waheed Rehman, was with him. Earlier that day, drones had been patrolling the skies for hours, but had become such a familiar sight in the area, that they were ignored. A few hundred yards from his aunt’s house one honed in and struck Aziz’s car. The two boys died instantly. Aziz’s uncle said their bodies were badly burned and mutilated, when people arrived from the village. The rescue party had held back at first, as drones frequently strike again, sometimes hitting those recovering the bodies. Pakistan has become the testing ground for a new kind of battle in the Global War on Terror initially launched by President George Bush across the border in Afghanistan after the September 11 attacks. Every day, remotely piloted Predator and Reaper drones, manufactured by the secretive General Atomics Corporation, hover over towns and villages in the northern Federally Administered Tribal Areas of Pakistan. Operated remotely by the CIA from the US, but launched from secret bases in Pakistan, they watch for “patterns of life” feeding back hundreds of hours of infra-red imagery via satellite for the spy agency to analyse. These remotely piloted planes launch Hellfire missiles at targets, sometimes day after day, and typically in the early hours of the morning. The first reported attack was in 2004, under President Bush. This was followed by a further seven strikes that year. But it is under President Obama that the drone war has picked up. All told more than 300 strikes have been carried out in Pakistan, despite the fact that America is an ally, and now on average there is a strike every four days. A year-long, continuing project by the Bureau has developed a database tracking all credibly reported strikes, and gathered information from on-the-ground researchers. The US administration rarely acknowledges the existence of the drones in the Pakistani skies. Officially it states that: ‘It neither confirms nor denies the existence or non-existence of the programme.’ When comments are made, they are anonymous leaks to the US media always claiming that the missiles have only killed militants and emphasising how they are a vital tool in the fight against al Qaeda and its allies. The high-tech weapons have killed many alleged high-ranking al Qaeda terrorists. Last year alone drones reportedly killed senior al Qaeda officials like Atiyah abd al-Rahman, the alleged second in command, Abu Zaid al-Iraqi, the alleged finance chief, and Ilyas Kashmiri, a legendary commander. Drones were also used to track Osama bin Laden’s movements before the May 2 Special Forces raid in which he was killed. Indeed the Bureau’s data suggests that at least two thirds of those killed are reported as militants, although only a few are ever named. The problem is that there is a growing sentiment, especially in Pakistan, that too many civilians are also being killed. Demonstrators in the capital, and beyond, burn effigies of the drones and brandish placards imploring the Pakistan government to push the Americans out of their country. It is becoming a politically sensitive issue, which is doing nothing to help already strained relations between the two countries. Could the teenager who travelled openly to Islamabad and willingly met with journalists and activists really have been a “terrorist” who threatened the US? Washington refused to comment. 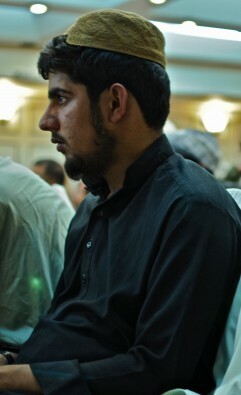 At the Islamabad gathering, like most of the other young men there, Aziz displayed no anger. He had simply listened to the speeches and answered questions when he had been asked. He had been quiet and slightly intense. But, he had been says Shahzad Akbar, a Pakistani lawyer working with families of drone victims, the most excited of all the attendees to get a camera and training to take back to document drone strike victims. ‘I remember he told me that he had a computer at home so he could download pictures from cameras and send it to me. When we met at the Jirga, he said, ‘remember we spoke on the phone?’ I said yes we did, and I am glad you are here and we will give you camera training and the camera to take pictures,’ Akbar recalls. His family is adamant he was not a terrorist. His uncle, who lives with the family, explains that he spent most of his time at home, playing on the computer that his father, who worked in the United Arab Emirates as a driver, had bought him. Many of the male members of Aziz’s family – Aziz was the youngest of seven but lived with many of his extended family – work as truck drivers along the route from Karachi port to the Khyber pass, delivering goods, often to US troops in Afghanistan. The money sent home has brought the family relative riches and paid for a concrete house. Militants do not travel 300 miles to the capital to be part of a Jirga and political rallies against drones. They come to Islamabad to blow themselves up. The Jirga itself was a good target. Akbar is so convinced of Aziz’s innocence, and that of his cousin, Waheed who was also killed, that he is preparing to bring a lawsuit against the US ambassador to Pakistan. He is now being helped by a British legal charity Reprieve, headed by Stafford Smith. Jemima too is helping to finance the lawsuits. Stafford Smith says that US intelligence is often wrong. ‘The only publicly available social science study of the accuracy of US government intelligence in Pakistan are the men they sent to Guantanamo where they got it overwhelmingly wrong. Over 80% of the prisoners there have been released without charge.’ Reprieve has represented roughly 10% of the 779 Guantanamo detainees and Stafford Smith visited the facility 24 times to work on these cases. With no Western journalists in the area and no official accounts, it is difficult to ever be completely sure, or more importantly, test the claims of guilt. But research by the Bureau suggests that civilians are being killed by the drones, and that some victims, like Aziz are under 18. After months of painstaking work the Bureau has found credible reports of 174 children killed in the strikes and between 479 and 811 civilian casualties. Under Bush between 182 and 280 civilians were reportedly killed in 52 strikes, under Obama there have been 268 incidents, with much less reports of civilian deaths. What that must do to you psychologically, knowing that most of the strikes happen at night. Lots of the men at the Jirga spoke of how their children couldn’t sleep. To be under constant surveillance by something that could actually kill you at any moment. Nonetheless Bureau research suggests that despite Washington’s claims, the strikes are still killing not only non-militants, but women and children too. Since June 2010, after Obama had ordered that the strikes should not put ‘innocent… men, women and children in danger,’ according to Brennan, the research suggests that at least 110 civilians have been killed. There are even four credible reports by news sources including the Wall Street Journal and the BBC that under 18s had been killed. In mid-August a strike in Miranshah, in North Waziristan hit a housing compound and a vehicle in the vicinity of a girls’ school. A local intelligence official was later reported as saying that two or three women and a child were among the dead. A year earlier, in the early hours of August 23 2010, Hellfire missiles hit a compound in Danda Darpa Khel, North Waziristan, allegedly killing ten militants. Among the dead were Bismullah, his wife and two young children aged eight and ten. They left behind three young orphans, who were shocked but had survived the blast. But the casualty numbers are just one example of the impact. Jemima was particularly struck by the stories told by the tribal elders at the Islamabad Jirga that described the terrifying reality of listening to the drones circle overhead day and night, over and over again. ‘The elders told us – ‘we are Pakistanis too. Just because we are from the tribal areas, does not mean that we are not Pakistanis. We are treated not only not like Pakistanis but not like human beings,’ says Jemima Khan. Jemima is determined that this message is heard. It was late morning and a golden glow lit the surrounding hills. Dozens of men had gathered in a flat, barren plain in Waziristan. Most were dressed in simple white or cream tunics with headscarves. Two coffins lay on old metal beds. A couple of black and white striped flags of the Jamiat Ulema-e-Islam party, which dominates the provincial political discourse, fluttered in a light breeze. Dozens of white Toyota Corolla cars, the preferred vehicle in the region, were randomly parked in and among the low scrub, together with a few pick-up trucks and a handful of motorcycles. Some of the men carried Kalashnikov rifles casually slung over their shoulders, but the majority were unarmed. They grouped around the two coffins, which had been made roughly from MDMF. It was early November. One of the coffins was draped in a blue patterned cloth. On top a photo of a young man in a red frame edged with roses had been carefully placed. A veneer finish made the second coffin look more expensive. It was wrapped in a red patterned cloth. Rested on top was a framed picture of the young man who had joined Jemima at the Islamabad Jirga – Tariq Aziz. A video of the funeral has been obtained by the Foundation for Fundamental Rights in Islamabad as part of a pool of evidence being gathered to prove Aziz was a civilian killed by a drone and seen by the Bureau. The video shows the men opening Aziz’s coffin to reveal the contents to the camera. The body of Tariq Aziz is revealed – a torso in a white T-shirt and a dark blue tunic. The body has been decapitated. One of the funeral attendees gently re-tucks the bloodied clothes around the remains and covers them with a blanket before the coffin is sealed for the last time. There is no anger, no chanting, no defiance, no slogans – nothing that would suggest this was a funeral of a militant. Troubled tribesmen, heads solemnly bowed, hands tensely clasped together at their waists watch as the coffins are lowered into the graves on green ropes. It is not usual to use coffins in this area, but many of the bodies recovered after drone strikes are so badly mangled and torn apart that coffins are becoming a necessity. After the men set down the coffins, they bow their heads as the call to prayer “Allahu-Akbar” wafts over them. Now and then, weeping can be heard, but mostly the hour-long event is surprisingly silent. There are other teenagers clearly recognisable from the Jirga, including Tariq Khan, one of the boys who sat next to Aziz. Many look deeply distraught. One man shakes his head over and over, a profound grief etched on his face. Each casket is covered by a slab of concrete and mud is used to seal the graves. Once the men are satisfied with the memorial, they step back and begin to sing one by one prayers from the Quran. Jemima has not seen the video, but she has been told. She finds it difficult to comprehend – a boy, not much older than one of her own half-Pakistani sons, a boy who like her son loved football, shot down by a remote-controlled drone from the sky. The attacks are never investigated. No one ever claims responsibility, no apologies are ever offered and no compensation is ever provided by either the Pakistani government or the US. A version of this story was published in the Mail on Sunday. Read the Bureau’s full investigation in US drone attacks in Pakistan and the covert war on terror being waged in Somalia and Yemen here.